"Diverse? You could say ... there's a weird kind of coherency about it. 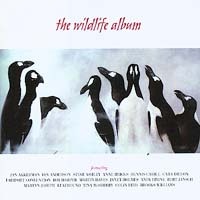 The first UK wildlife charity album since the Spike Milligan Beatles-involved 1969 compilation (four stars)"
That's how Britain's Mojo Magazine welcome the first Wildlife Album on its release in 2004. 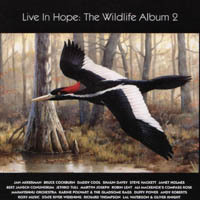 Now, its success has spurred on a worthy successor - “Live in Hope - The Wildlife Album Vol 2” - - a more ambitious, more cohesive collection with, again, all profits going to the World Wildlife Fund and Ulster Wildlife Trust. This latest wildlife charity fund-raiser offers 19 tracks from an eclectic array of international folk, rock, jazz and classical artists including Roxy Music, Jethro Tull, Richard Thompson, Mahavishnu Orchestra, Jan Akkerman, Steve Hackett, Shaun Davey, Bert Jansch and Bruce Cockburn. Every track is on the theme of nature and the album boasts contributions recorded exclusively for this release come from Welsh singer-songwriter Martyn Joseph, Scottish singer-songwriter (and 2005 BBC Radio 2 Folk Awards multiple winner) Karine Polwart and cult English rocker Andy Roberts (ex-Liverpool Scene / Plainsong / Grimms), amongst others. This beautifully packaged release comes with booklet notes by nature columnist Simon Barnes (The Times). Film buffs notes: opening track, ‘Eagle Rock' was a 1971 hit single for Daddy Cool and a retro poll-topper several times over in Australia, and features prominently in the new horror movie, 'Wolf Creek'.